Over the years we have worked on every brand and style of pool table out there. As with any product, some tables are better than others. 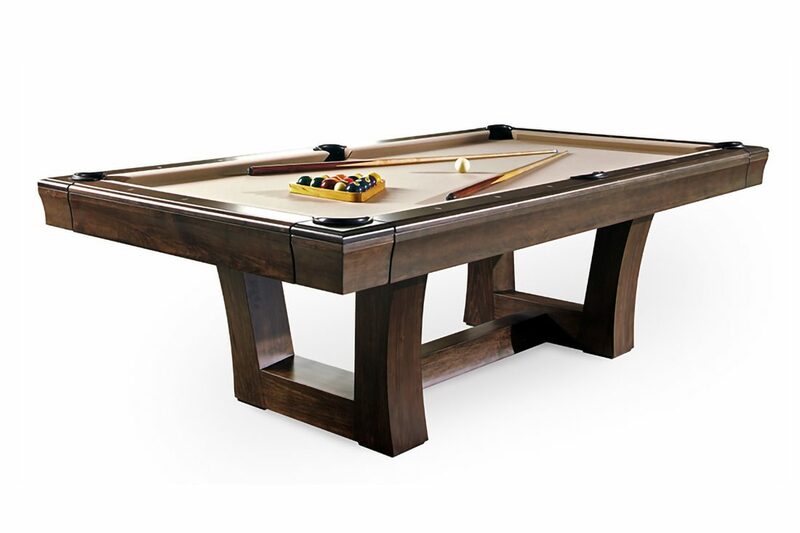 Below you will find our reviews of several popular pool table brands. These are honest reviews regarding the quality and construction of particular tables. Yes, post the first draft of these reviews we have picked up some new pool table lines. These reviews are not because of the lines we carry. The lines we carry are more a product of these reviews. Either by us approaching the companies or by the companies approaching us. So remember, these are unbiased reviews. Not reviews written by a person or company that sells a particular brand or works for a particular online seller as an installer. These reviews are written by someone who is in this business, actually setting these tables up every day, not a consumer who is looking at a table in their living room. So enjoy the reviews and feel free to contact us if you have any questions. We are happy to work with you wherever you may be in the US to help you find the table you are looking for new or used. Pricing in the reviews is reflective of the New England market. Prices will vary in different parts of the US. All pricing includes basic accessories. Current used market pricing may skew slightly higher. A brief word regarding our tiered system: Although there are 4 tiers of tables listed here it is important to note that all are of some level of quality and worth consideration for purchase new (if available) or used. Within any particular tier there will be tables that are the top of the class, not all in the same tier are created equal. For American Heirloom see Gandy. For Highland Series see AMF. Schmidt has been in the pool table business since 1850. Always making top quality pieces. Most Schmidt tables are solid body construction with the ability to knock down if needed. The bodies are typically built as oversize bodies so the slate bolts directly to the body and not an added top frame. Wood, rubber, hardware and slate are all of the highest quality and their products are still made in the USA. Schmidt offers custom work as well as their standard line of tables. Their offerings of wood varieties, stains and options are second to none and they will work very hard to make sure your table gets the custom touches that you are looking for. We rate A.E. Schmidt tables in our top tier quality wise. Beating what they produce is not an easy task and they will stand above most other brands feature for feature. As a company, Schmidt is very easy to work with and provides great customer service. When you call, it is very likely the person on the other end of the phone will be named Schmidt! Used A.E. Schmidt tables fetch very good money. $500–600 on base models and much more as you get to solid wood / custom pieces. AMF tables are listed in the 3rd tier on our quality chart, but that should really never stop anyone from considering one. In terms of commercial tables or lower end 3/4” slate / plastic pocket modern style tables they really excel. On the lower end line their Savannah model (also went by a couple other names) may be the best built table of this type out there. Standing next to a Brunswick Bristol 2, which was more popular, the Savannah beats it feature for feature hands down. Thicker, heavier frame, wider hardwood based top rails, all metal trim and a top quality laminate make the Savannah our #1 choice when seeking a lower end quality pool table. Commercially, AMF never really gained traction in the market as the Brunswick Gold Crowns stole the show, but overall with the exception of the leg levelers AMF’s Advantage table will stand next to a Gold Crown (3 or less) in terms of quality, construction and play ability. We wouldn’t call it a commercial table to seek necessarily, however we would not recommend you run from it either. As for AMF’s standard line of pool tables, they are in the second tier as they can go head to head with most other brands when it comes down to it. They used quality woods, hardware, pockets and cushion rubber. Brazilian slate that is 15/16” thick, usually framed in poplar. Built every bit as well as the Brunswicks of the 80’s and 90’s style for style. AMF also built tables called The Highland Series. These tables are borderline top tier but have some of the same issues listed below that keep them here with the rest of the AMF line in tier 2. These tables are beautiful pieces of furniture. Why is AMF 3rd tier? First, they are not full frame construction. They get built out of a box with metal brackets. It is a fine form of construction the way they did it, using very thick gauge steel for their brackets but will never be as solid as a full frame construction method. They did use an oversize frame with the slate bolting directly to the body, but the top of the body was typically lined with particle board for the screws to catch. Hardware is acceptable but could have been better. The rail bolts are only 1/2” and the washers are thin and weak, they tend to bend when properly tightened, especially since the slate backing is hardwood with no give. Not the easiest tables to install at times, especially when building from scratch. Many models were not made standard with a center beam. Overall, don’t shy away from used AMF tables. They are every bit as good as most others out there and can be a great addition to your home or game room. Pre installation look to spend $200 to $300 for a Savannah model, $350 to $800 for their standard line depending on model, $600 to $1300 on a Highland Series and $300 to $700 on a commercial table. It is said there is a time and place for everything. That is also true with pool tables. You will notice that American Heritage only appears in tier 4 of our rating system, which is an upgrade as of 2017 after being left out altogether. This is actually a reflection of recent design changes that make it a much more respectable product than it was previously. We will give them credit in 2 areas. 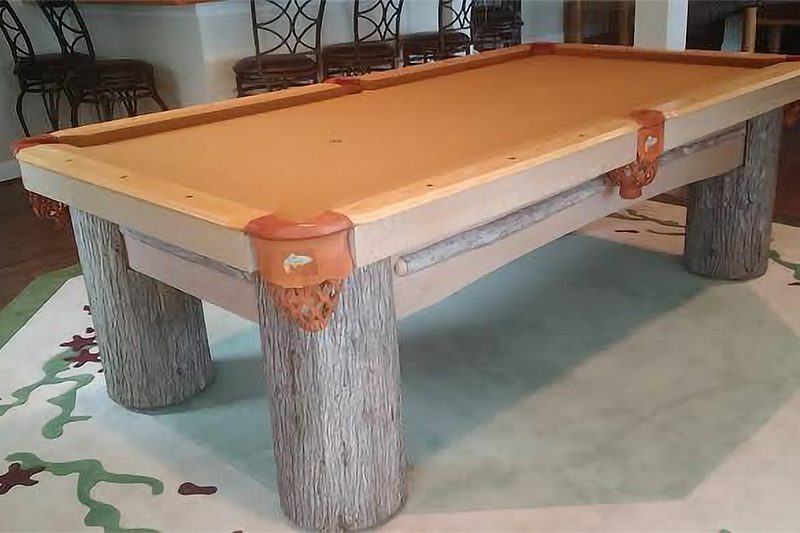 First, some of their early, American made tables were acceptable in most areas of quality and construction, and if you are looking for a pool table that really just needs to LOOK great on a very small budget, this may be a good brand to consider however you can get a much better quality / brand table used for similar money. They have made an effort over the last few years to really increase quality and I like the way the company is going. What is bad about older models you may ask? Largely mystery “woods”, second rate pockets some not actual leather, absolute junk hardware, leg receivers that pull out and do not allow for proper tightening, low grade cushion rubber, second run slate mostly unbacked non-matched sets, finishes that are prone to cracking, out of box construction with thin flimsy brackets, under size frames with flimsy particle board top frames and they are typically an installation nightmare. Considering what else is available on the market, I would not generally recommend buying a new American Heritage to anyone. However, if style is the #1 concern, they do have some newer models that should warrant consideration. Rarely would I recommend a used one but that is mostly due to sellers not realizing the cost to cure and pricing them well above value. If you are looking at buying a used AH make sure to have a real professional thoroughly inspect it before putting any money down. Pre-moving and installation don’t ever give anyone more than $500 for one of these as a general rule. Some do warrant a little more of an investment but consult multiple professionals first as 99% of people who “do pool tables” do not really have the first clue what they are worth. Expect to replace cushion rubber on 99% of American Heritage tables on the used market. Being in the business for over 170 years gets your name out there! 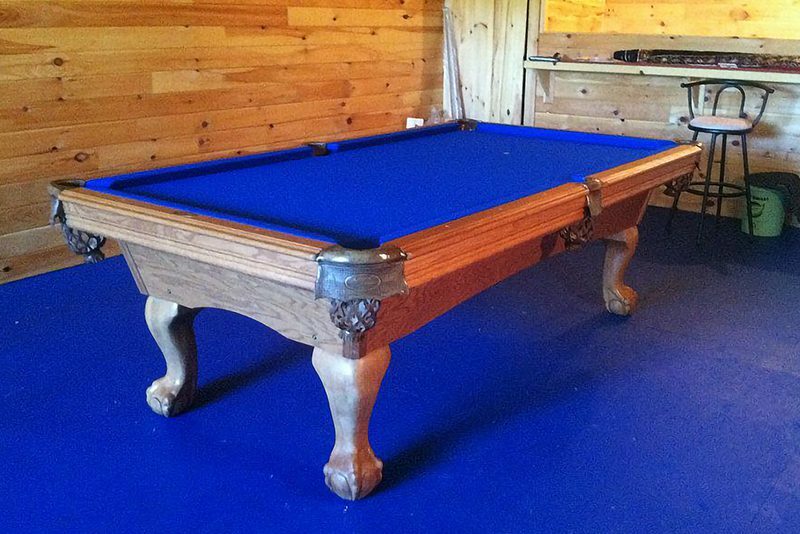 When it comes to high end antique pool tables, Brunswick is the one you want. Although there were several other manufacturers that made similar quality products, Brunswick managed to take over a market like no other company in history. They lead the way in Antique tables and have also dominated the commercial table market with the Gold Crown table. Like the antique tables, the Gold Crown has had a lot of competition. Some are as good or better quality wise, however the Brunswick name and its long standing in the market have helped to make sure none of them got a solid hold on the commercial market. Even the Brunswick Medalist was a solid commercial piece. As for home tables, excluding antiques, pre year 2000 Brunswicks are a solid 2nd tier table. Decent woods, Usually quality cushion rubber, first quality slate, thick gauge metal braces, quality hardware and a very durable finish are all solid features. They are a 2nd tier table based on out of a box construction, the rubber that was sometimes not good, the pain they can be to properly square the body, lack of a center beam, cross beams that serve no real purpose and do not even contact the slate and retail pricing that is extremely inflated compared to identical quality / style tables on the market. That said, an antique Brunswick, Commercial Brunswick or any home table made before Y2K is a decent choice for a used table. Before buying or selling a used antique Brunswick make sure to consult a real pool table professional. There are several companies that can provide you with accurate market values of these tables based on condition. Make sure to find certified pool table appraisers, not just pool table repair people, to give you values. These tables range from worth only $200 to the moon. 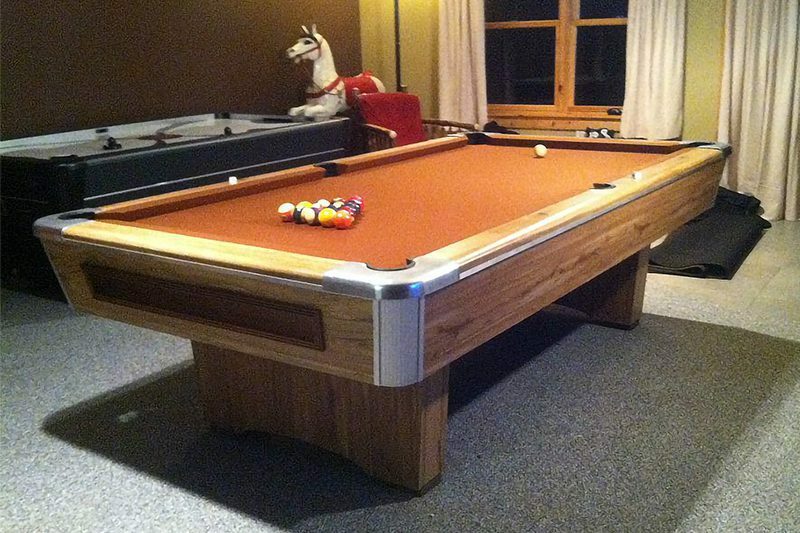 As for their commercial tables, try to be $500 or less on a Medalist pre move / install. Gold Crowns will range from $400 for a GC2, $500–$800 for a GC3 and $800–$1000 for a GC4. The GC5 has not really hit the used market yet but should not even command GC4 money when they do. In terms of the pre Y2K Brunswick tables, something like a Brunswick Bristol, Bristol 2, Sherwood style table, (modern style, plastic pockets) have little to no real value at all used as the value is less than that of a professional move. It is very very important with these tables to never move them in 1 piece nor ever buy one that has been. Also do not ever pay more than $200 for a used Bristol 2 or similar table and be very cautious of the rubber as it is not of high quality and not a standard profile. To have a professional re-rubber a table you are purchasing puts the cost of the table well over its installed value. As for other Brunswick tables they range from $300 to $1200. Something like a Tahoe (tapered legs, tapered body, laminate) goes in the $300–400 range, where something like an Orleans may command closer to $1000 to $1500 depending on condition, etc. Now we are very careful to make a distinction between pre Y2K Brunswick Tables and the tables Brunswick produces today. The Brunswick tables of today are all imported, very low quality, right out to lunch retail pricing and if it was not for the name would not even have a share of the market. New, one can do much better in terms of quality and price without looking too far. I won’t even jump into what is wrong with these tables as there is nothing right about them. Again, feature for feature they get crushed by several competitors. Used, these carry little to no value at all. If the style of one does catch your eye in a limited used market do not look at paying more than $300 for a Contender series or $500–600 for anything else. An American owned company that is sadly more of an asset group now. Despite a star studded lineup of owners and management from across the billiard industry the pool tables they are producing, or importing to be correct, are subpar in terms of quality. I will credit them, if you are a shopper whose main focus is looks for the money, C.L Bailey’s products are at the top of the imported list just a step below Legacy. Still not what I will call a quality piece but as a piece of furniture to look at not bad. In terms of value new, you can do much better with a used table from a quality manufacturer. And there are new tables of far higher quality available in similar price points. Used, these tables range from no value for a lower end Addison to no more than $300 for a pristine “wood” table. Older Baileys from their pre import days may be worth much more but are very hard to find and take a real professional to identify. In 2016 we began carrying the California House line. We picked the brand up mostly to give us a high quality option on bars, pub tables, poker tables and barstools. However their pool tables’ modern styling and ability to create entire matching game rooms got us several sales in the last 2 years. With that, having sold and worked on several of their tables now I am ready to write them a review. I will start them as a tier 2 table. They are very solidly constructed, the frames always line up perfectly, hardware is acceptable and when shipped they are meticulously packaged. On their modern style, enclosed pocket tables, their corner fastening system is far and away the best on the market. Price wise, for the unique styles they offer are very reasonable from most dealers. The ability to build a high end game room in coordinating styles is another great plus to these tables. Why only tier 2? The only knocks construction wise would be in hardware, mostly rail bolts and slate screws. The other factors come down to the company, which there is nothing at all wrong with!! However, while super easy to work with and family owned / operated they have a limited selection. Also, wood upgrades can get very pricey compared to other brands. Stain selection is small and upcharges for custom / other finishes can be heavy for the industry. That said, keeping the selection small offers a consistency in color that is unmatched in the furniture market. I have ordered pieces a year apart and the color is so good that you would think they were stained together. (Of course this is not a guarantee of color match, no company can do that, but this is as good as it gets!) If you are looking for a new table and one of their styles fits what you are looking for do not hesitate and look no further. If you are looking to do an entire game room and want a high end setup then California House is your brand! If their tables are to be found used, they will price out on the high end, 2–3K range to start. No longer in business, but this Canadian company built a tank of a pool table. Quality woods, ultra solid construction with a metal inner frame, high quality cushion rubber and true 1” first run slate Cameron makes it into our 3rd tier quality wise. Although they are some of the best playing tables out there they are relatively obscure in the US and were known to have minor problems from the factory that made them an installation nightmare when first assembled. Buying one used is a good investment but keep a couple things in mind. The base frame is VERY heavy, keep where it is going in your home in mind, if it is going up stairs around any turns etc. this may incur you extra costs with your installer. Also make sure, since most of these tables needed special tweaking at install that the installer you choose is knowledgeable about this brand before you hire them. Don’t just ask if they have ever heard of Cameron or have worked on Camerons make sure they can tell you that they are heavy metal framed bodies, that many of them had to have the rails shimmed up so the balls didn’t jump off of the table etc. If they do not know these things, they shouldn’t be handling a Cameron. Used, a homeowner owned Cameron can be worth $400 to $800. Many Camerons were purchased as Pool Hall tables as they are very heavy duty and some room owners liked the higher end look of an Antique style table over the Modern style tables. Pool Hall Camerons should fetch in the $300 to $600 range each. CBB has been building pool tables in Canada since 1973. Don’t let their 3rd tier status or company scare you away from them, they are almost a 2nd tier table and absolutely the best of the 3rd tier. Being the limited number of these out there in the US in most markets our sample size in terms of actually working on these is small, perhaps if we worked on a higher number we would rate them higher. Quality materials throughout for the most part, the only issues I find are that some of the hardware is subpar and occasionally the wooden trim pieces break, however they have always been an easy fix for us. CBB is absolutely worth a look new. Of all currently available manufacturers ahead of them on our quality chart only AE Schmidt makes tables with similar styling and although CBB is in our 3rd tier, their pricing is better than Schmidt for not a lot of quality sacrifice overall. If the styling of a particular table in the CBB line is what you are after have no reservations about passing on a Connelly or Olhausen to get it. Used, a lower end CBB should command the same money as an Olhausen Reno or Connelly Reddington in the $200–$400 range, upper end models can fetch $800 even $1000 in the right market / condition. Newer CBB tables with coordinating dining table tops can fetch an additional $200–$500 for the top alone depending on wood and condition. Connelly starts with the finest quality woods. They offer their tables in more types of wood than their competitors, more stain and finish options, have always used a true 1” slate and now their 2 upper collection tables come standard with 1.25” backed slate! Except for very early models and a few that were made special for NAMCO, all Connelly tables come with a 4 bolt rail system. 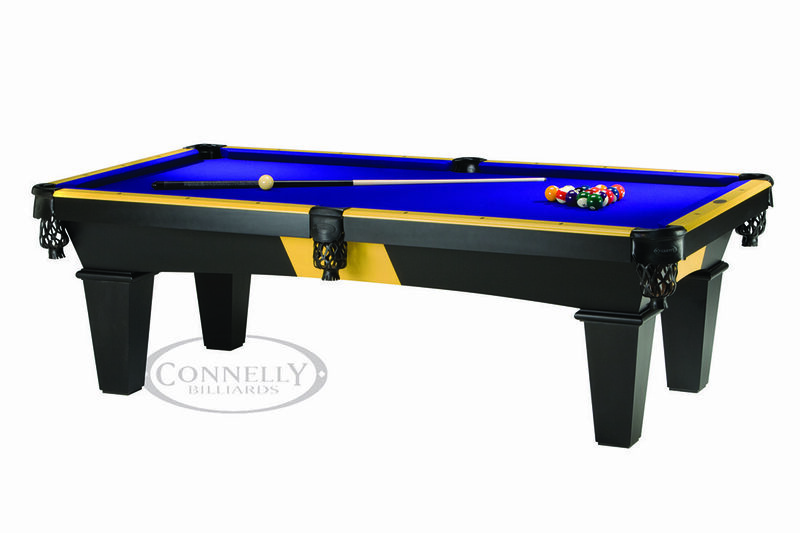 This reduces vibration making a Connelly table play more accurately than any other brand. Combine that with the Icon cushion, (a snooker cushion, 100% gum rubber (just like Olhausens Accu-Fast, developed in England) used standard on all Plateau and Pinnacle collection Connelly tables since 2005 and their “rapid rail” is the only branded rail in the industry that is actually different from any other standard rail out there and more than just a name. Their Canyon collection tables currently use a Mercury cushion which is a bit stiffer than some other cushions in the market, while a good cushion I believe they could do better but for the money it won’t be beat. They also offer one of the largest varieties of sites (often referred to as diamonds although many are not diamond shaped). Connelly frames are full body construction unless ordered as a knock down body from the factory. The frames are over sized meaning they are larger than most competitors and the slate bolts directly to the frame of the table, not a “top frame” as employed by other brands. Most Connelly frames are 2” thick and have a center beam as well as 2 cross beams. Even their hardware is superior to their competitors. All of the bolts, washers and screws used in construction are far more than what is really needed and heads above anything else on the market today. There are some negatives with Connelly which have popped up. Dealing with the factory directly was a dreadful experience from time to time. They seem to have things in order now. More of a pain for dealers than something the end customer will ever see. We always still get what we need in the end but the service was, for a time, lax. They take a certain kind of installer to work with them, the pockets go in tough but are VERY tight, the bodies are the heaviest in the industry, the slate is the thickest and heaviest and the hardware is larger and there is more of it. This will lead some installers to claim that they do not like to work with them. Not a negative by any stretch. The lowest end of their line is a table called the Quartsite. It’s actually an imported low end table with the Connelly name however it does employ the 4 bolt rail system. 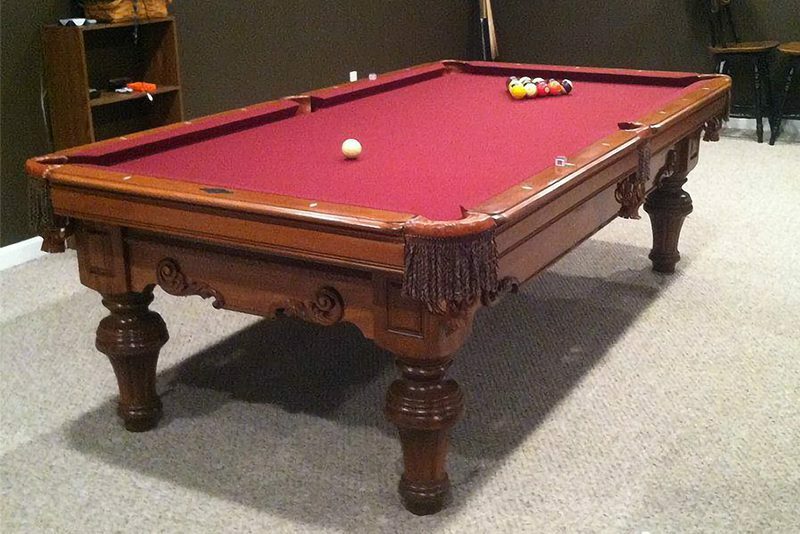 Compared to similar tables of this type notably a Brunswick Bristol or AMF Savannah it is far better built than the Bristol, constructed just a little less solid than the Savannah but the 4 bolt rail system makes it a better playing table. Its downfall is the fact that it was only available in black. Look for these to be no more than $200 to $300 used pre install. Connelly has discontinued the Quartsite from its current line. Next in the Connelly line are their laminated tables and entry level solid wood. Their base laminated table is called a Redington, it is a standard tapered body, tapered leg table with looks just like Olhausens Sheraton, Drake etc., Brunswicks Tahoe and AMF’s Tacoma models. Of all those the Redington is far and away the heaviest, best built best playing of the group. Look to find this table used in the $400–$500 range. 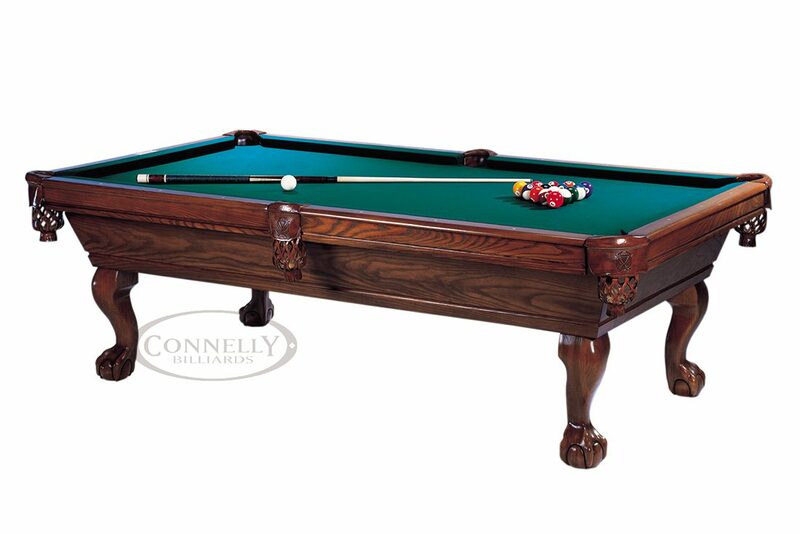 As for their entry level solid wood, although they are 1” bodies, Connelly’s lower end pool tables will rival anyone else’s mid-level products. Easily the best value on the market right now. Look for these tables used in the $600–$800 range. When getting into their upper level tables nobody even comes close in terms of play ability, options and overall value as Connelly tables will always come in at a lower cost than their competitors tables. These tables used start at $800 for a Catalina, $950 for a two-tone Prescott, $1000 to $1500 for most used Pinnacle tables up to the $2000–$2500 range for a Mission or strait body table. Buying a new Connelly is a no brainer. You will get more table for your money, hands down. There is a buyer beware to buying a used Connelly. I have seen many listed used that falsely advertise what the table actually is. This is not because the seller is necessarily trying to deceive you but more a case of they go online and copy the features of the current Connelly line and apply it to their table, which in most cases do not apply. There is an easy way of telling exactly what you are looking at in terms of Connelly features….look at the name plate. If the name plate is on the side of the rail what is called the “blind”, and is small and rectangular then you are looking at an early Connelly. May even be a 3 bolt rail, possibly Tulipwood or Poplar and the values above will be on the lower # side probably much less. If the name plate is in the head rail and is larger and rectangular then you have a middle aged Connelly. 99% chance it is a 4 bolt rail but it will only be a 1” slate and have the standard cushion rubber, not the 1.25” slate and the Icon Cushion. These fetch the low to middle values. The newest generation of Connelly tables have an oval name plate minted in brass or a brass printed plate on lower level models. These will have the 1.25” slate and the Icon Cushion and will fetch the upper end of the values. Connelly also makes a table called The Ultimate. This is not one particular table and many times I see Connelly Ultimate advertised on a table because the name plate said the Ultimate in Billiards. Most any table in their line can be made into an Ultimate. 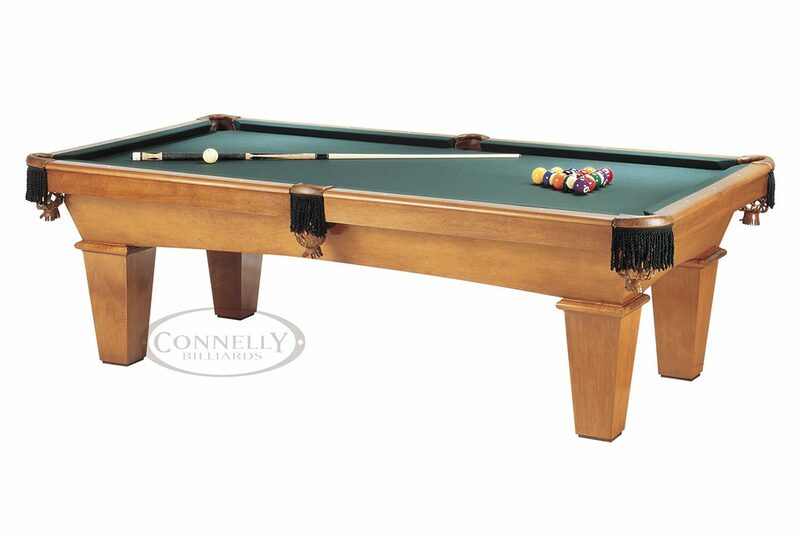 There is no truer, better playing table on the market anywhere than a Connelly Ultimate table. An Ultimate upgrade gives you a 4” thick body, 2-4” thick center beams, 3-4” thick cross beams, a 4 piece set of 2” thick slate, backed and pinned, an extra inch of width on the rails and a 5th rail bolt in every rail as well as larger pockets. The playability is unmatched. Starting used values on these are $2500. Although overshadowed still by Brunswick and the Gold Crown, Diamond builds some of the best commercial tables on the market. They use a 4 bolt rail and now use a one -piece slate making moving them into pool halls and setting them up simpler. Diamond smart tables are the best table currently made for the coin industry although on both of these fronts the pricing of their tables is a downfall. The other major downfall with these is the lack of dealer friendliness. There is no real dealer discount on Diamonds as opposed to other brands, making lack of customer service via dealers difficult. Older Diamond commercial tables are nice although slightly flawed in their design, employing a 4 bolt rail system however 1 bolt per side rail lined up with the slate seam making it essentially useless. Diamond also made a line of home tables and while the overall quality is good, the retail pricing for what you were getting was outrageous. The home tables are worth around $200–$500 each, older Diamond commercial tables can go as high as $1500 and the newer one-piece slate tables in good condition can sell as high as $2500. Not even going to waste time with this one. Absolute, total garbage. Don’t buy one new, Don’t buy one used, Don’t take one for free…..unless you badly need firewood or some slate for landscaping. As rustic log tables go, Drawknife is at the top of the pack. Unique designs, solid construction, quality cushion rubber, first run backed Italian Slate with Olhausen cut corner pockets and well made coordinating accessories like racks, bridges and cue holders. Drawknife tables are the best choice if the rustic look is what you want. Only real downfalls are a sometimes slightly compromised stability on older used tables due to construction and certain bolts being unable to be tightened properly (mostly because of incorrect installation teqniques). The slate…being from Olhausen is thin at just shy of 7/8 inch on newer models, (older models employed a full 1” slate) and the high retail costs due to the uniqueness do not always carry over to the used market. If you are selling a Drawknife used, hold on to your hat. You likely won’t see nearly what you would think for it. The same uniqueness that made it appeal to you for your space will be the reason. It’s a limited market. Buyers should be able to pick these up, pre install in the $1200 to $2000 range. Obviously the very high end and total custom stuff will command much more but by the same token the market is even further limited. These are a good buy new if rustic log is what you seek, and used they are solid tables if you don’t overpay. 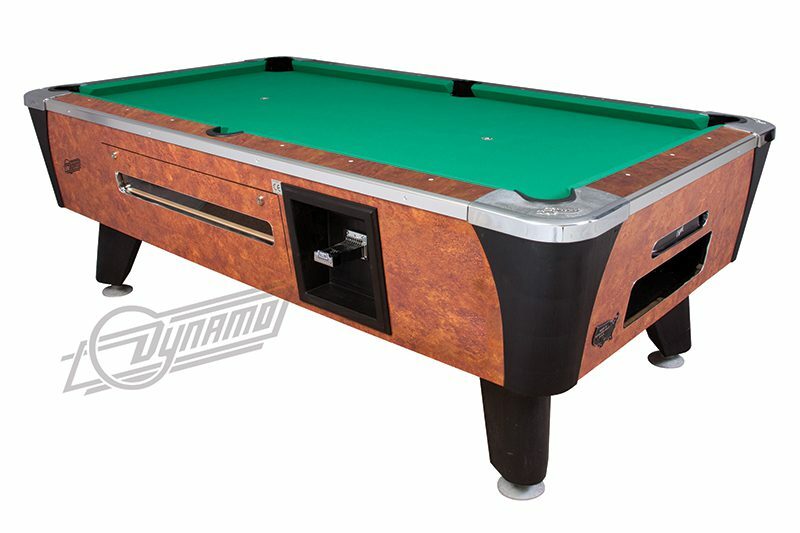 Dynamo is most known for producing coin operated pool tables. The older Dynamo coin ops are tanks. As a table they play much better than most coin tables on the market with a standard set of balls. If you are using it as a coin table, play does seem compromised due to the heavier cue ball used to trip the cue ball return but that goes away when the table comes home and a standard set of balls gets put on it. Dynamo did make a line of home tables for a time. They are low end and poor quality but the ones we have encountered went together really well and play decent after. They aren’t a bad table on really short money. For a time Dynamo (Valley-Dynamo) was owned by Brunswick however currently Valley-Dynamo is owned by a group which also owns Sun Glow, Champion Shuffleboard, Connelly Billiards and Tornado Foosball. Buying new, the coin tables are a good purchase. Used Dynamo home tables are only worth about $100 max pre install and are not the quality of other $100 value tables on the market, but if they present themselves to you for the right $ and none of the other tables are readily available then go for it. Dynamo coin tables should sell used starting around $300–$500 for an older model and $800 to $1000 for a newer one. An even lower end arm of CL Bailey, I make them separate as many dealers try to market them totally independently. Looks wise they look to be top quality. Overall there is no reason to ever buy one. Poor quality throughout. For the same or less money than these new you can get a quality brand used table. While Gandy may be best known for building commercial tables they also built a very nice line of home tables. Commercially, the Big G was quite a success. Eventually pushed out of the market by the much more recognizable name brand in the Brunswick gold crown but still, the Big G was a great table. Solid construction throughout, thick framing, a more solid leg than the gold crown, hardwood rails quality hardware, thick slate, great play and a nice modern styling. Dollar for dollar I would never push anyone away from a Big G compared to any other commercial table on the market. Value of these should be directly comparable to any GC3 on the market. As for their home tables also nothing to shy away from. Great wood selection, professional craftsmanship, quality hardware, slate, lively rails and decent construction. Gandy home tables went from very simple and box like to the standard tapered, routered body with intricate legs. A good quality, solid product makes Gandy a 3rd tier table. The little things are really what keep it from the top 2. On lower end models like the box style the wood on the legs is fairly thin, its only trim not structure but they do tend to un glue over time at the seams. Most Gandy tables copied Bunswick and AMF in the way their blinds are attached but did not manage to do it quite as well. A skilled installer can make them perfect but it can be a pain. Their higher end tables had less issues but were very pricey on the retail end for what you got. Pre install on the used market look to pay no more than $300 for the basic box style Gandy, the standard tapered leg tapered body models, veneered tables and the other lower end models go in the $300 to $500 range. Higher end Gandys may command up to $800 and in rare examples more. At the end of the Gandy company, around 2001, the company became American Heirloom. Although they traded on the Gandy name, don’t make the mistake of thinking this is the same company or product. These tables are not made with much quality and have no real used value at all. If you find one in the $100 range and a professional installer that is directly familiar with them, who knows that they will need parts from their hardware box to replace the junk hardware that made it through the initial install, then go ahead, but as with a lot of table brands out there, you can do a lot better. Golden West may be the most complete pool table manufacturer in America. While all table companies purchase some materials from outside sources, Golden West surely buys less of those materials than its competition. Considering the lengths GW goes to to work in-house, it would not surprise me in the future to hear that they were casting their own hardware or growing the wood on their own lot. GW tables are a great example of quality made right here in America. They are ranked in our 3rd tier of tables. They are a solid product for the most part but some of their lower end tables, undersized frames, poor cushion rubber at times / on certain levels of table and as with many brands an inflated retail price, prevent them from moving into the second or even first tier. The lines of the tables and stain colors are like no other brand out there. 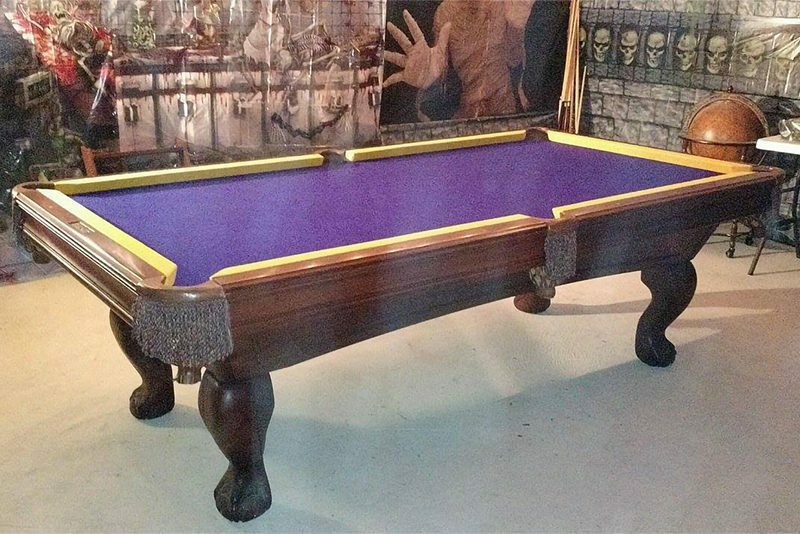 GW puts a lot of style into a standard pool table. Fully constructed bodies are another nice feature of GW. Like top tier A.E. 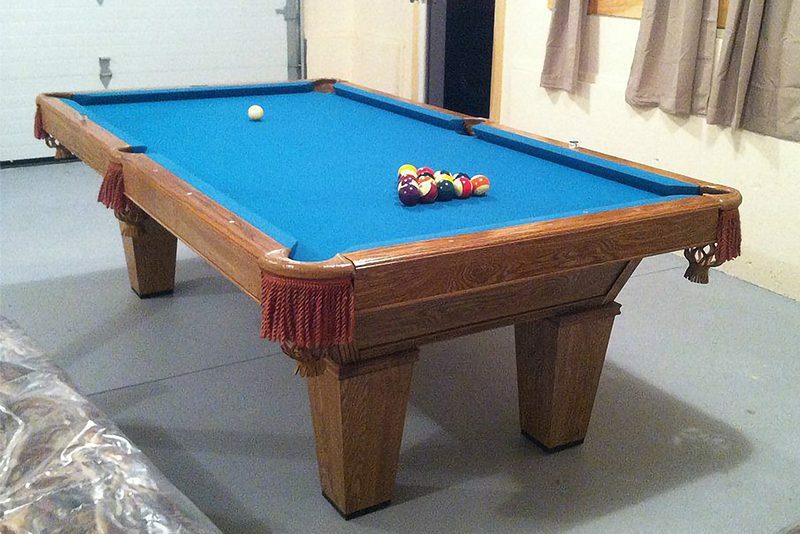 Schmidt, they will build you a complete custom pool table or sell you one from their line. Much of their custom stuff could be considered first tier products with no reservations but the same quality can be achieved for a lower dollar elsewhere. The biggest issue we come across with GW tables is that most will have a name plate that says Custom Golden West Pool Table or Customized for you by Golden West. In reality the table is not at all a “custom” product. Golden West throws that word around far too freely in my opinion. Again, they do make custom products but most GW tables out there are standard tables, the only thing a customer may have done is choose the finish color, pockets, legs and cloth. This does not make the table a custom product. All quality pool table manufacturers give you this option. This is the biggest buyer beware to GW, you are likely not getting a custom product despite the name plate. Sears brand of pool tables. The best models are great for an outdoor fire pit, use the slate to build the sides and the particle board for the fire, cloth burns nice too! The rubber may smell a bit but there is not much of it, it’ll pass quickly, the hardware gives a nice orange glow when heated too… pretty cool after a few cold ones… the lower end stuff won’t even give you a good fire pit. In your home, I am sure you can find a cheaper laundry table. Don’t buy these new, don’t buy these used. They are garbage. You may as well flush your money straight down the toilet, and if you have $500 to waste you can spend $800 on quality used. 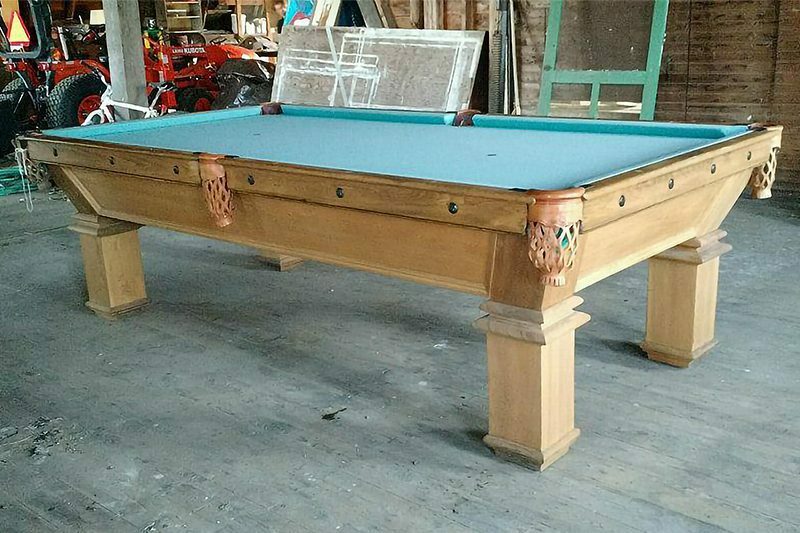 Antique pool table manufacturer from Boston, Massachusetts building pool tables from the late 1800’s to the late 20’s early 30’s. 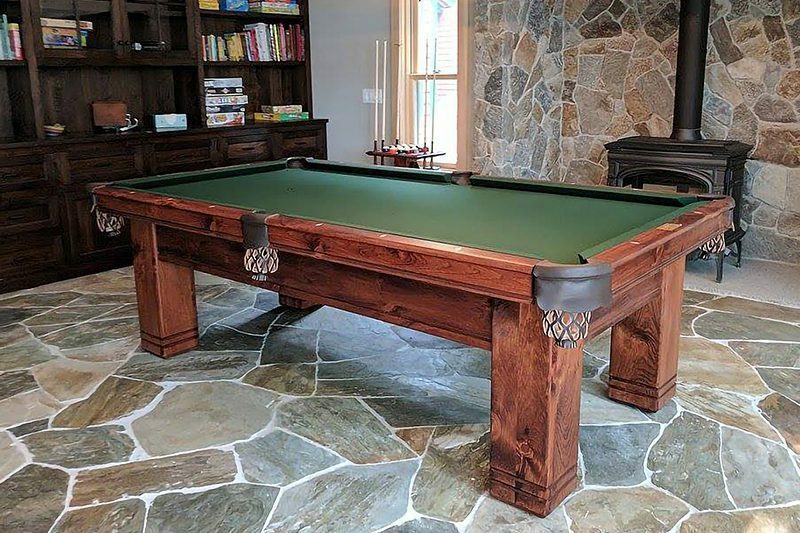 While other pool table companies at the time would order Brunswick tables and embellish them with additional trim or sometimes just pop out the name plate and insert their own, JE Came was not one of them. They built excellent pool tables. Every bit as high quality as what Brunswick was building. Not as intricate but just as high quality. Un restored JE Came tables run from only $100 in value to $1500. Most will be in the $300–$500 range. Restored, Came’s will run $3000 for the most basic up to 15–20K for fancier high end models. If you have read any of my other reviews you may have the idea that the imported tables are not our favorites. While Legacy tables are made in China, they really are built with some American quality control (a concept other table companies claim but do not really employ). These are the only solely imported tables whose manufacturer makes it into any tier of our list. While the finish options are limited, the wood is a mystery, they are not a very dealer friendly company and are on the pricey side of the imported stuff, Legacy brings over a good product overall. Solid construction, over sized frames, hardwood bracing, first run slate and a delivery option of right to your door as well as actually qualifying their installers. If you are going to buy online, Legacy is the only company I recommend using. And while other companies who import have also jumped into the total game room furnishing market, Legacy offers a better selection and higher quality product than the rest. 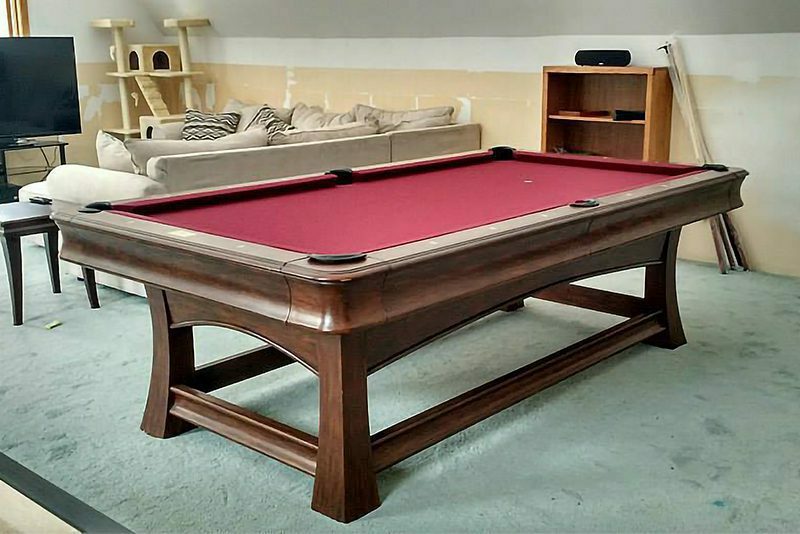 If you require a new pool table and the higher quality manufacturers are out of your budget and you have decided to order online look no further than Legacy. I can conclusively say however that you can get a higher quality used table for the same or better money. Of course if you are trying to put together a coordinating game room on a small budget, Legacy should be your first option. Used, because of the low initial cost and considering what else is available on the market Legacy tables carry very little pre install value, ranging from $200–$400. The game room furnishings should only bring in about 25% of what was initially paid, which is still more than what other manufacturers products should bring. As box store junk goes I have been surprised by the quality of certain parts of Mizerak tables. Their low end slate tables with plastic pockets have a good thick slate. 2nd run, but that is par for that price range. The rails on these tables are built well too. Of course the rubber is crap, and the rails are screwed down with regular screws and not bolts and after a good slate and top rail the table really goes to crap. They are a total waste of money new. You can get a far better quality used table for less money. Used they have no value at all as for the cost of a professional move you can buy something much better. Even if you are a move it yourself kind of person…there is better stuff out there for free. Don’t sink dollar one into these used. 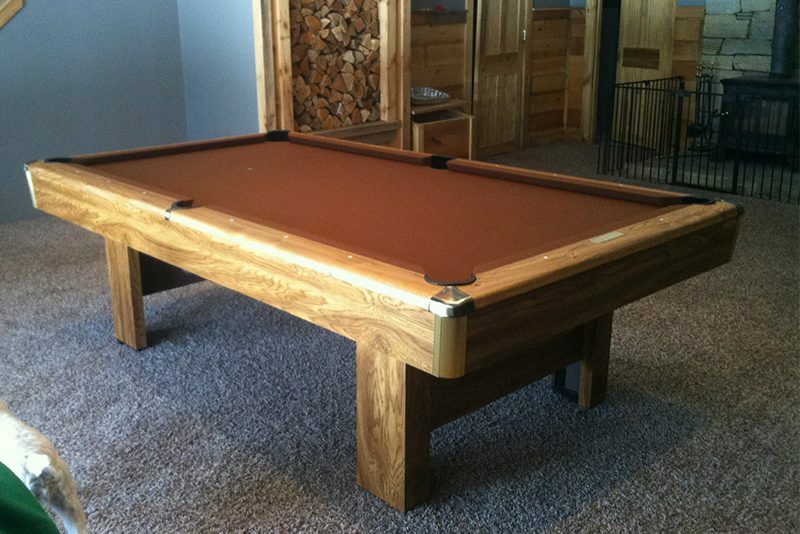 As custom log pool tables go Northwoods products are as good as rustic pool tables get. As for their standard line of tables, while limited, they are built well and priced well also. The Best in Billiards they claim! And for most people its right up there with Brunswick when they ask about used pool tables. It is an American brand and extremely well advertised. As for the BEST in Billiards…maybe. They are a very solid 2nd tier table. The wood is high quality, the frames are almost a full body construction and they offer a ton of color options per table as well as custom finish options. They install beautifully. Bodies stay pretty true, slate is high quality, hardware is nice and the corner pockets have a different cut in the slate and are by far the easiest to pull cloth into. Overall a great quality product. So with everything so good why aren’t they a top tier product? Pretty simple really. Put one next to a top tier table. Not a high end top tier vs a low end Olhausen but table for table overall. The top tier table will be better than the Olhausen on many features and in the case of one of the still manufactured top of this second tier brands (Connelly) you will pay a lot less for it too. Other downfalls include a lower end line that was for a time, made out of country and imported with the nameplate, bodies that even on the higher end lines are thinner than top tier (and even some fellow 2nd tier) products. Slate that is now sometimes just shy of 7/8” still being advertised as 1” and despite being a full body construction some of the frames are a little undersized and employ a top frame for the slate to bolt too. They have also had problems in the past with their rubber. Many tables used an older Championship rubber called Fleetwood. Its a K66 rubber and will almost always need replacing if you come across one. This brings me to rails. Olhausen brands their rails as Accufast. What is different about Accufast rails?… It is a special compound, they play great and it is extremely rare that they ever need to be replaced. Otherwise though it is still a regular old 3 bolt rail…nothing over the top special. Catchy, and very good branding! Buy one new? On quality / looks absolutely. Value…ehh. You really can get a better table for less money. Olhuasen retail pricing is severely inflated and thanks to all of the advertising and paid endorsements people are more than happy to pay good money for them. Yes, you will be shown a deep discount from retail at the time of purchase but you are still, in many cases, paying more than you really should. This retail structure really hurts their tables used. The internet is full of used Olhausens, they are a popular brand! Problem is most are extremely overpriced. A base model Olhausen something like a Reno…laminate, tapered body, tapered legs, maybe a little trim has a maximum used value of $400 (like a Connelly Redington, Brunswick Tahoe, AMF Tacoma etc.). And that is providing the condition is perfect and the rubber is good too! I see these all over Craigslist, ebay etc. for $600, $800, even $1500. Not even close to worth that pre install. Other Olhausen models despite the high retail are only worth $500 to $1200. Very very high end examples, which are rare, can go for more but figure if it retailed under 8K, $1200–$2000 is the maximum you should look to spend on it. Contacting a Used Table dealer, not just a mover or in some cases the Olhausen dealer will get you a better idea what your used table is worth in your area. 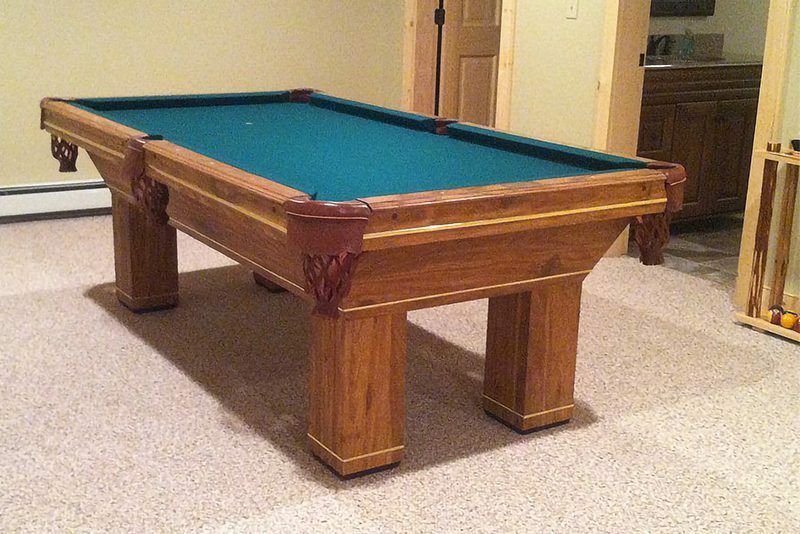 Some of the best constructed pool table cabinets I have come across are Peter Vitalie’. Always first quality wood, top notch hardware, full thickness slate and beautiful, unique designs make Peter Vitalie a top tier table. While no longer in business it is not because their product lacked. Quite the opposite. Peter Vitalie tables commanded high dollar brand new and because of that had a very limited market. When faced with a down turned economy and high influx of imported tables, the Peter Vitalie Company had a choice. Build a cheaper product or close. They chose to close. Rumors that they were purchased by American Heritage are completely false. This is likely a mix up with Gandy who closed and became American Heirloom. The only quality issues Peter Vitalie had was the rubber they used. We have rarely done a used Vitalie without the need to replace the cushions. Otherwise a rock solid, top quality piece of heirloom furniture. Used, the common Vitalie models can be found starting at $800 pre install. From there its all about style and condition. Used Vitalie tables can still be sold in the 6K range complete depending on model. Best advice is to seek several opinions before pulling the trigger on one. But be assured, if it has the Vitalie name you are getting a top quality product. Like many other companies reviewed here Presidential builds their tables overseas. Africa is where you will find these come from. Chosen for the access to quality, exotic woods and a workforce of craftsmen willing to work for little. On looks and craftsmanship Presidential could be a 2nd tier table. Get into frame construction, rubber, slate and hardware and for your money, you can do much better elsewhere. Buying advice new–If they have something truly unique, that nobody else seems to have that fits your space perfectly buy it. Presidential tables are not “junk”. Something unique is worth a buy. Something in more of a standard, run of the mill style really is not. Used these tables are all over the place in terms of real value. Basic Presidential tables start at $200 and the more unique and ornate tables can go over $800. 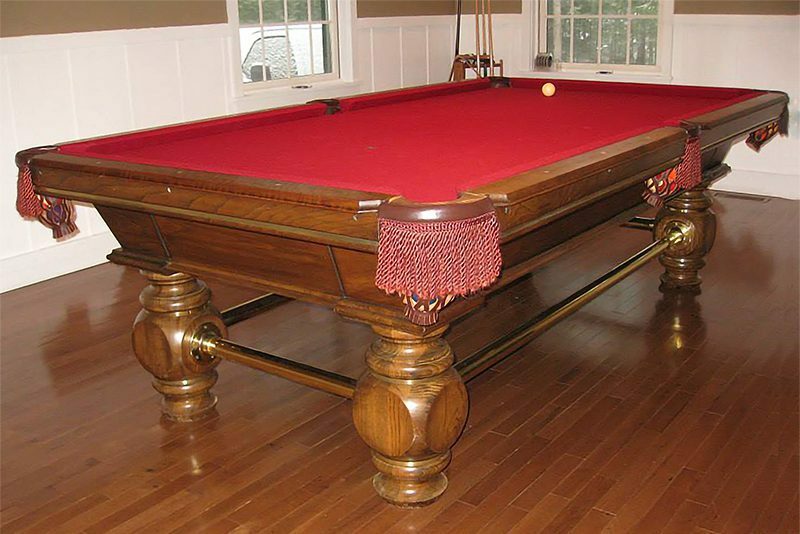 Renaissance pool tables are absolutely exquisite pieces of furniture. We do not list them in a tier as they are essentially a top top of the line AMF. Many of the tables in the Renaissance line are as good as anything manufactured in the top tier of tables. The body panels are minimum 2” thick hardwoods, the finishes are magnificent and the detail on some of them is something to behold. These tables range from as good to much better than anything even Brunswick was producing in the 70’s and 80’s. Downfalls to some of these tables are a very high price although well in line with the market and tables of similar quality and some were made in the typical AMF style with metal brackets holding the frame pieces together. If you find a Renaissance table and it fits what you are looking for, do not hesitate to purchase it. The most basic of the line will sell pre install on the used market for around $800. The most intricate of these tables retailed at $69,000 however could have been easily purchased new in the 35K range and based on the really low demand may still even command that dollar to purchase. Shelti made a mean coin table. They cut out a lot of the fat that was in coin tables for many years and built a great quality, compact table that played better than anything before it. Sadly they have not really stormed the market and taken over from the big boys and are now overshadowed by the smart table. If you have the opportunity to pick up a Shelti used don’t hesitate. $500 to $800 is appropriate depending on table / cloth condition. On paper Spencer Marston looks to be a great table. Visit their website and like everyone else they will tell you their tables are the industry leader, superior, the best built in America! And while they appear to have the features of a top quality table a closer look shows that that is just not the case. While typically 2” thick every Spencer Marston body I have ever worked on has some kind of twisting to it despite the double center beams. While some wood is US sourced (Oak and Birch) a lot of other wood is harvested overseas so not always what a US consumer would expect from a “Solid Wood” table. Still, they are actually solid wood. In our opinion, not the quality of wood found on other brands, but solid nonetheless. Color (stain) selection is very limited. Slate, while claimed to be top quality sourced from Brazil (typically the best slate you can get) and China (not so much) just does not seem to react like other top quality slates on the market. We find inclusions, marbling and impurities all the time and the slate tends to flake when the heat to apply the wax is applied which we do not find on other better rated brands of table. We also find that the sets of slate are not matched sets. Similarly, it has been our experience that the rubber is sub par quality also despite being 100% gum rubber. They claim that pool table slate should screw directly to the tables frame on their website yet their tables do not use this method. Their slate screws to an add on piece that is attached to the outside of their frame. To make matters worse, the piece is not even a full top frame support, it is literally 2 small pieces of wood attached to the frame on each side. New, these tables come in just above the bargain basement priced tables but do have some better styling options. Course they are internet specials! I would not recommend purchasing one of these to anyone as they are very low quality and have no value on the secondary market. I will say though that the owner of the company is passionate about the product he sells and shows willingness to hear opinions on his product and make it better. Spencer Marston is still a newer brand (2004) and companies like Olhausen, Connelly and American Heritage all had some sub par product when they started too and have all made improvements. Look for Spencer Marston to do the same. Used these tables are only worth $200 pre install but unless you live in a terrible market there is likely something better out there for you. But as with anything, if you like the style and it is available, go ahead. But shop around with local table mechanics first, many will not even touch these tables. Thomas Aaron tables are all imports. I’m usually very harsh on the imported products but in the case of Thomas Aaron they were on the leading edge of the import game and actually brought over some very nice products. Their standard lineup of tables was only 6-8 deep but each was a unique piece. The uniqueness of their tables really sets them apart form any other brand on the market. These models were used quality construction methods went together very well and play as well as any home table on the market.These tables were also surprisingly affordable and were available with coordinating game room furnishings that were as unique as the tables, and high quality as well. Which is almost unheard of now in the game room furnishings market. If they had only produced the small line of unique tables and were even still in business I would have no problem listing them as a 3rd tier table, but including their lower end line, which was actually a great starter table at a great value, lack of finish options and just average hardware and rubber they were a solid 4th tier product. If you are looking at one used and the style catches your eye don’t be afraid to buy it. Look for their tables to come in around $2-300 for the lower end tables and their more unique upper end tables to sell for $500 to $1000. The game room furnishings are worth buying and paying for with a table, on their own the value takes a significant hit. 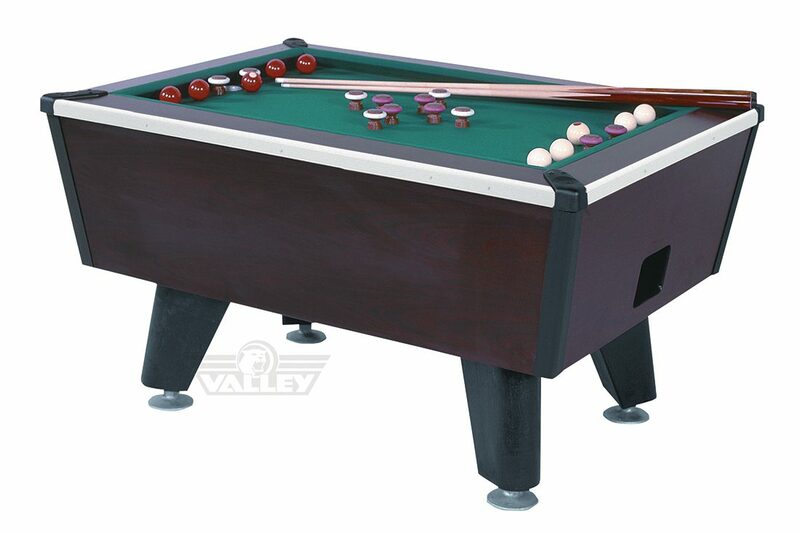 Valley is by many considered the leader in the coin operated pool table industry. If you are looking for a coin operated table a Valley is an excellent choice. They are built well, play well and parts are available for all of them both new and used. Valley tables are still a good buy used if you need a coin table or if your particular application requires a 1 pc slate. Look to purchase these used between $300–$800 depending on overall looks, condition of rubber and whether or not it is in need of new cloth. 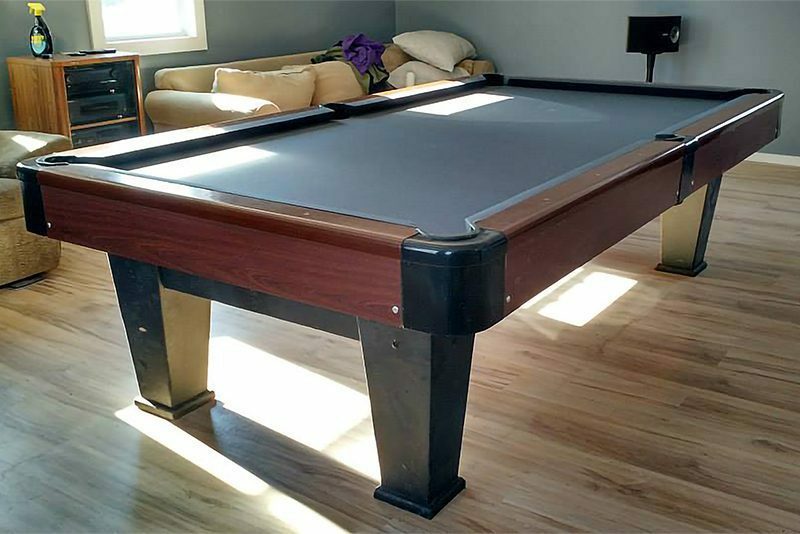 If you are looking to purchase a new or used bumper pool table look no further than the Valley, it is the best bumper pool on the market. We do not list these in our tiered system as being largely coin operated / commercial tables it would be unfair as these reviews are generally meant for homeowners and used table buyers.